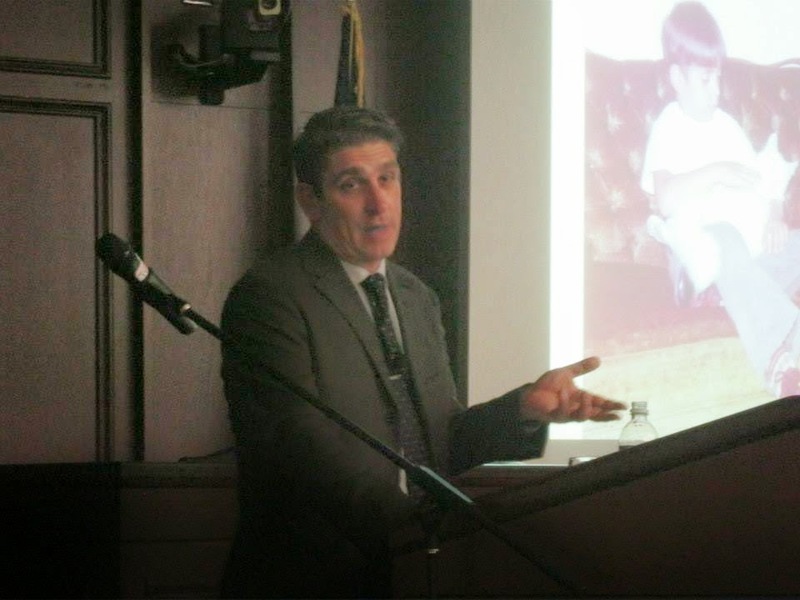 Last night, the President of Roger Williams University, where I am an adjunct, hosted Richard Blanco, the poet now famous for having read at President Obama's Second Inauguration. To Blanco's credit, he seems just as surprised as anyone that he was invited to read at such an event and he seems to have taken this as a mandate to speak for poetry to the American people. He is nearly a rockstar, invited to events everywhere and writing poems for various events and causes. He even showed his own face on a billboard promoting a cause he believes in. Strange to see a poet on a billboard. Frankly, we, the American poetry community, need it, to an extent. No, I am not with Dana Gioia in that we should get back to poets being super important parts of American life but I do think we need someone who is willing to be the person who travels around showing that poetry in America is very much alive. For the most part, this is where we, in our creative writing programs, etc., run into issues. I think that poetry for most people is not just inaccessible, but something that have no desire to access even if time permitted. That is very unlikely to change, of course. It seems very likely to me that poetry will remain for poets in our society and that it will be hard to grow into the general reading public on our own. And I am certainly not suggesting that poetry should be accessible for the sake of sales, etc. Poetry should be chaotic thought but I do feel there should be a way into that chaotic thought. I do not think that the poetry community does anything for language/writing or any community by being more available simply to be popular to the general population, which is unlikely to happen regardless. However, that does not mean that poetry should not have a way in and I believe Blanco is a perfectly interesting way into the world of poetry. He did something last night which surprised me a bit: he did not just read poems, he gave a talk about himself, his experiences and, to an extent, the role that poetry has played in his life and the role he hopes poetry can play in the lives of others. I think this is really important as it seems much of the poetry community has deemed this beneath them- and maybe it is to a certain extent- but simply pointing out the role of poetry in modern society does not seem like something to be shunned and it certainly does not seem like we, as poets, should dismiss the non-poetry-reading-community for not immediately being inclined towards reading poetry without a way in. I think fiction has a nice balance here. We read narratives from a very young age. Children's literature is all about creating, however simple, a narrative. Poetry is always going to be a step beyond that and we should not feel guilty for that but we should accept that there must be some way into the world of deeper reading that perhaps does not exist outside of the university setting, for better or for worse. And, again, perhaps it is perfectly fine the modern poetry has its space within academia but that does not mean there should be not attempt at all to take the various goals of contemporary writing beyond that public. The crowd at RWU last night was interesting. It was advertised across the school and through the town of Bristol, RI and the surrounding community. Basically, beyond our own creative writing department, there was still a good crowd of folks who, more than likely, would never have seen a poetry event come along, much less attend such a thing. This is Blanco's power now, to bring people into the world of poets and poetry. From there, people are free to do what they like. As RWU's President said to me after Blanco's talk, now people have to choose what they want to do but having Blanco there gives people that choice. Maybe folks will read more poetry, maybe they'll never read a poem again- who knows, but now that option is there. Blanco even said as much in his talk. For whatever reason, poetry (and a few other art forms) seem to turn people off very quickly. If you do not get one poem or one thing, it becomes immediately inaccessible and, I would argue, because there is no desire in American society to go further into anything that is not immediately accessible, people avoid it, often by dismissing it with that favorite word, "difficult." When I spoke with Blanco after, I noted how tired he looked. All this is weighing down on him, I said to him. Not only does all of this keep him busy but he also feels he has a task in an attempting to get poetry back out of the classroom and into the hands of ordinary citizens. I mentioned to him that Jackie Robinson took it upon himself, after his years in baseball, to become an ambassador of sorts for Civil Rights in this country. He felt he was in a unique position to help the movement by speaking his opinion. This is not to say Blanco is in any way like Robinson (which he laughed at when I mentioned the idea) but like Robinson, attempting to be on the forefront of something could be very difficult, long-term, on him personally. But perhaps the sacrifice is important. Maybe it is something that, because so few are willing to do it, must fall on him. He has been given a unique position among American poets to do something which we cannot, even if it is not something anyone would ask for. I think that while the folks who I consider my own cohort are doing interesting work, there should be someone saying that there is a role for poetry in American society. Maybe that will never happen- maybe it never SHOULD happen, but that does not mean there should not be someone saying it. Richard Blanco, for the moment, seems to be that person. Maybe he is not the ideal candidate- I have not even discussed his work- but at the present time, he seems to have some kind of hold on the population at large and if poetry is what he is promoting, perhaps we should not be too quick to judge him for how he handles it all. (Honestly, how would any of us handle such a thing?) He has something most poets in this country never will, the ear of the public. Perhaps his opinions and thoughts will not land him on the cover of Time Magazine, but there are people who will give some thought to his comments. Is that not something we as a poetry community can at least be somewhat appreciative for, even if we do not agree 100% with all of it? Surely some will be unable to reconcile these things, but I think having someone who is quite concerned with the role of poetry in society having a place in the public sphere is not a bad thing.